Maxwell Scott: "This is the West, sir. When the legend becomes fact, print the legend." vahşi sıfatı dönemin koşullarıyla ilişkili olduğu kadar bir düzeni sağlayışın da temelinde derken ortaya sürdüğü argüman mitleştiriciliğe uygun daha çok. ford için belli ki bu bir problem değil fakat zaman geçtikçe nostaljiden çok reaksiyonerlik uyandıran bir tarafı var filmin. yine de kurduğu üçgen ve dengelediği farklı yaklaşımlar bugünün siyaseti için dahi ilgi çekici. 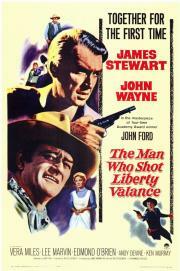 A pure classic, with Jimmy Stewart playing his Jimmy Stewartiest and John Wayne playing his John Wayneiest. The script is what elevates this to what is possibly John Ford's best work. One of the boundary lines between classic Westerns and modern deconstructions: this succeeds as both. (100 Westerns Project #1:) Really enjoyed my first John Wayne movie ever, ironically one that features him in more of a supporting role. It does have a bit of a cheap backlot sort of look to it, but the contrast in the two central men's views on civilization and law and how to solve the Liberty Valance issue makes for a consistently involving morality tale, one with an admirably bittersweet aftertaste and many memorable characters and moments. "This is the west. When the legend becomes fact, print the legend." The first time I saw the movie I enjoyed a great western with great cinematography, characters and story. The second time I found more depth and allegory. I appreciated Wayne's character especially even more. Sure, Stewart was too old for his role, but you forget this as you become absorbed, unless you're looking for reasons to dislike. I believe Stewart and Wayne themselves are crucial to the tale. John Ford is a master.